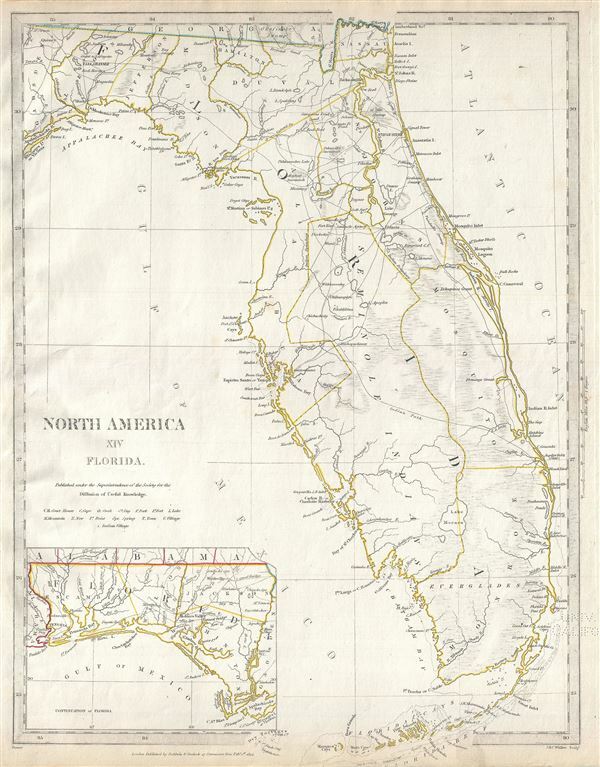 This is an uncommon 1834 map of Florida issued by the Society for the Diffusion of Useful Knowledge, or S.D.U.K. It covers the state of Florida in its entirety with its westernmost portion depicted in an inset in the bottom left quadrant. The map identifies several Indian villages, forts, lakes, mountains, towns and a host of additional topographical features. Lake Okeechobee, here identified as Lake Macaco (as it was known in the early 19th century), is depicted to be much smaller. Territorial boundaries are marked with outline color, including the territory of the Seminole Indians. Within a year of this map being drawn, Florida would witness the outbreak of the Second Seminole War, the second of the three conflicts between the Seminole Indians and the United States Army. The Second Seminole War would last until 1842, until the army gave up the fight. It resulted in most of the Seminole being forcibly removed from Florida although some remain to this day, staunchly entrenched deep in the everglades. Rumsey 0890.141. Phillips (Atlases) 794.